The George Washington and Jefferson National Forests are U.S. National Forests that combine to form one of the largest areas of public land in the Eastern United States. New River Trail State Park is a 57.7-mile rail trail and state park located entirely in southwest Virginia, extending from the trail’s northeastern terminus in Pulaski to its southern terminus in Galax. Mount Rogers is another Grayson Attractions. 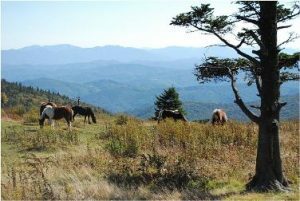 Mount Rogers is the highest natural point in the Commonwealth of Virginia, United States, with a summit elevation of 5,729 feet above mean sea level. Whitetop Mountain is the second highest independent mountain in the U.S. state of Virginia, after nearby Mount Rogers. It is also the third highest named peak in Virginia, after Mount Rogers and its subsidiary peak, Pine Mountain. Another one of Grayson Attractions is the Blue Ridge Parkway. The Blue Ridge Parkway is a National Parkway and All-American Road in the United States, noted for its scenic beauty. Chestnut Creek School of the Arts is the place to learn a new craft or perfect your art. Their classes are small and the prices are reasonable. With over 20 classes available for beginners or advanced students there is something for everyone. The Blue Ridge Music Center is located at mile marker 213 on the Blue Ridge Parkway. The center includes an indoor theater, a gift shop, hiking trails, and the exhibit, “Roots of American Music”. 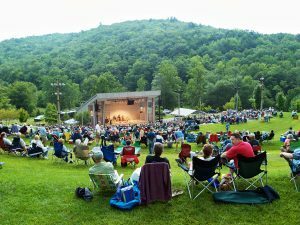 Every summer from May to October, some of the biggest names in old-time, bluegrass, country and roots music come to perform at the outdoor amphitheatre. Visit the website for the performance schedule. Bring a picnic and enjoy the best in traditional music! Arts Council of the Twin Counties – Serving the City of Galax, Carroll County and Grayson County, this organization offers performing arts across the region. Visit the website to learn about year round events, such as; children’s theater, winter concert series, arts in the schools, holiday extravaganzas and more. Elk Creek Dragway is an 1/8th mile IHRA sanctioned Drag strip with phenomenal races. The track, which has been in operation since 1968, has proven to be a top choice for family entertainment. Don’t forget to schedule some “race time” during your next vacation. Located in Independence, VA, Grayson Rec Park features a great area to have a picnic under our covered picnic shelters, a place to take a nice walk on our paved walking track, or our wooded hiking trails. The park also features 5 athletic fields, tennis courts, and an outdoor basketball court. During the summer, our outdoor pool featuring two water slides, two diving boards and a concession stand is a great place to come and rest in the sun. Just outside the park, resides a beautiful waterfall to view and enjoy. Youth sports are offered year around. The park puts on a variety of special events throughout the year. Fitness Classes are taught during the Spring and Summer. The Picnic Shelters, Ball fields and the Pool are all available to be rented for any occasion. 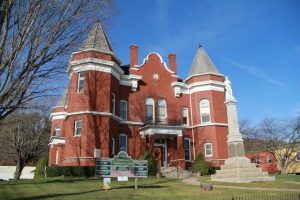 The Historic 1908 Courthouse serves as the Visitor Information Center for Grayson County Tourism. Find travel brochures and information on local attractions and lodging here. The Treasury Gift Shop features unique local crafts and gifts.The building hosts the Crossroads Museum and serves as the cultural center of Grayson County. For a glimpse back in time, visit the Matthews Living History Farm Museum. This 21 acre demonstrative farm offers programs in gardening, antique tractors, sheep shearing, craft demonstrations, open hearth cooking and more. The farm is available to the public year round, please check the schedule for special events.